Nose: Alcohol, coriander, brie cheese rind, citron peel, juniper. Palate: Sweet and full bodied. Alcohol, juniper, cane sugar, candy orange slices. Finish: Sweet and fruity. Citrus, coriander seed, cinnamon. Mixed: Does well in a Dry Martini. Very good in drinks involving red vermouth like Negronis and perfect martinis. Not great with tonic or in a Tom Collins. The earthy elements clash with the mixers in those last two. Parting words: The first Huber to farm at the site of Huber Farms in Southern Indiana was Simon. Born in Baden Baden, Germany, he started farming in 1843 and the family has continued farming on the same site, only forty miles from the hot springs in French Lick, Indiana. Then as now, wine making and fruit production were the mainstays. Now the (much expanded) farm is a destination for pumpkins and other U-Pick favorites and is home to one of Indiana’s biggest and best wineries. They started distilling in 2001. Brandies are their best known spirits, but they also have vodka and gin (obviously) and a variety of fruit liqueurs and infusions, including an excellent blueberry liqueur. They have two stills currently, operated by owner Ted Huber and master distiller Lisa Wicker (formerly of Limestone Creek). This gin is similar other craft gins (Few and Corsair spring to mind) but it has a pronounced aroma that I can’t quite put my finger on. Cubeb, maybe? At any rate, like those gins, 1843 is best in quality cocktails but pretty good neat too. Keep a bottle of Seagram’s next to it in the cabinet if you plan on guzzling a lot of Tom Collinses or G & Ts. 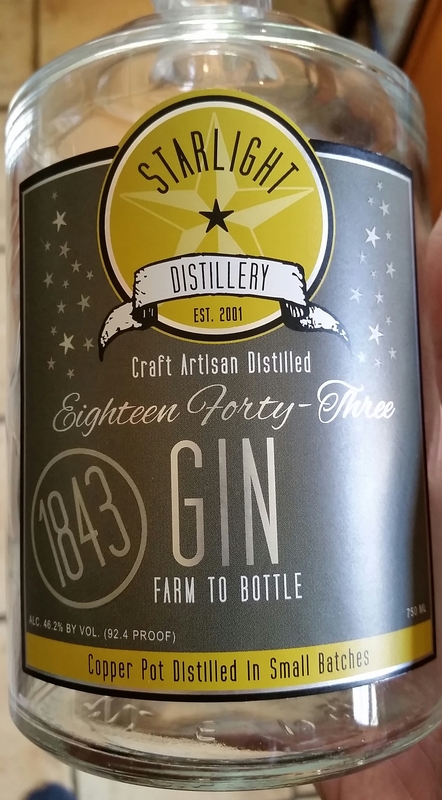 For a craft gin of this quality and ABV, $30 is a very good price. Eighteen Forty-Three Gin is recommended.